Augusta Savage was a leading figure of the Harlem Renaissance, a cultural reawakening forged by artists, authors, musicians, and playwrights in the 1920s and 1930s. Ignited in part by the migration of Southern blacks to New York, where a large community settled in Harlem, the leaders of this movement sought to elevate African American culture and society by using visual art, literature, music, and theatre to challenge derogatory racial stereotypes and cultivate black pride. Augusta Christine Fells was the seventh of fourteen children born to Cornelia and Edward Fells, a poor rural preacher, in Green Cove Springs, Florida. The small town’s ancient mineral spring and numerous clay pits were an abundant natural materials resource for young Augusta, who developed an early affinity for shaping forms. The Fells family moved to West Palm Beach when Savage was a teenager, and her interest in sculpture grew with more formal education. In the years that followed, Savage took advantage of opportunities to learn and to teach, and also to sell her work, pushing past conventions that would have otherwise kept a black female artist from succeeding in the South—or virtually anywhere else in the United States. At the urging of her Florida mentors, she made the bold decision to leave her family behind and, with less than five dollars to her name, in 1921 moved to New York to more seriously pursue the study of sculpture. Savage enrolled at the Cooper Union, where her extraordinary skill, particularly in creating portrait busts of African Americans, quickly drew praise. Encouraged by this success, in 1923 she applied for a women’s summer art program in France. Despite her considerable talent and enormous potential, Savage was ultimately denied admission by program officials who believed her race would be “disagreeable to some white students.” The controversial decision stirred national headlines. In a letter to the editor of the New York World, Savage lamented the prejudice she routinely encountered: “One of the reasons why more of my race do not go in for higher education is that as soon as one of us gets his head above the crowd there are millions of feet ready to crush it back again to that dead level of commonplace.” Undeterred, Savage continued to produce art, working in steam laundries to pay the bills. First created in 1929, Gamin was a critical work not only to Savage’s career, but also as an embodiment of the Harlem Renaissance’s mission. The representation of the solemn, sensitive youth expressed the inherent dignity of African American identity that many black artists sought to promote. Here, Savage captures an arrested moment, a sense of true immediacy; the child's glance feels natural and uncontrived. 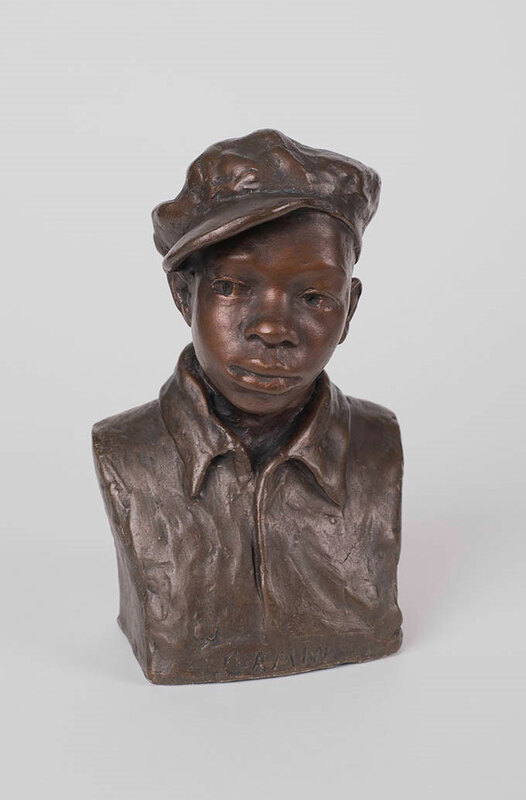 While the subject is presumed to be her nephew, Ellis Ford, Gamin was conceived as a type rather than a portrait, representing one of the city’s countless street urchins. With his cap turned to the side and his savvy gaze, this clever gamin would have been instantly recognizable to contemporary New Yorkers. The critical and commercial success of Gamin catapulted Savage’s reputation far beyond Harlem art circles. The breakthrough sculpture garnered the attention of patrons and at last earned her a fellowship through the Julius Rosenwald Foundation to study in Paris. She arrived there in the autumn of 1929 and connected with fellow African American expatriates like Henry O. Tanner, Nancy Prophet, and Hale Woodruff. In late 1931, in the midst of the Great Depression, Savage returned to Harlem, where she concentrated on teaching and advocacy through neighborhood-based programs and projects funded by the Works Progress Administration. Savage’s legacy is inextricably tied to her leadership of these initiatives and specifically to her role as an instructor and mentor to some of the most important African American artists of the postwar era, including Gwendolyn Knight and Norman Lewis. Classes at her eponymous Savage Studio of Arts and Crafts, established in 1932, and later at the Harlem Community Arts Center and the Harlem Artists Guild attracted pupils both young and old, and served as a beacon of hope for a legion of aspiring African American artists.